A ‘78 Ford Fiesta with pristine interior for only 400 bucks! The boxy ready-to-go looks sold me immediately. I began dreaming of building a little rally inspired, tough-looking commuter car; maybe some amber fog lamps on the front bumper, BBS rims and some mud flaps. To put it in perspective this car came to America only five short years after the 1973 oil crisis. During a time when American cars lumbered around with massive cast iron V8s and appalling efficiency numbers the price of oil per barrel tripled. Incidentally, this is what led to laws mandating better fuel economy. With the memories of limited consumption and waiting to get to the pump in lines that went on for blocks fresh in their minds, folks were looking for something cheap to own and operate. Enter the first generation Ford Fiesta. The U.S. version of this little gas sipper came with and came with a carbureted 1.5 liter four cylinder backed by a four speed manual. The simplicity of this set up means that if you find one today you could service it with a few wrenches and a Haynes manual. They even made a snazzy hot hatch version of these things called the XR2. Which beats the Prius from 0 to 60 mph and, in my opinion, looks great doing it. Am I really suggesting we all run out and find a car which is old, noisy and likely unreliable? 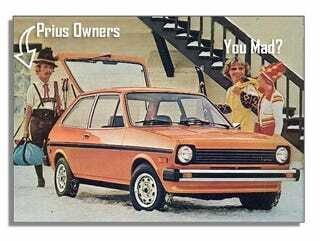 No, but it is facinating to me that you can still get a lot of mpgs without financing something brand new. If the technology to make something this efficient existed 40 years ago, why didn’t it work itself under the hoods of more cars available in the states?